Welcome to the MeiGray Group Game-Worn Jersey Authentication Program's 2018-19 Goal & Game Puck Auctions. 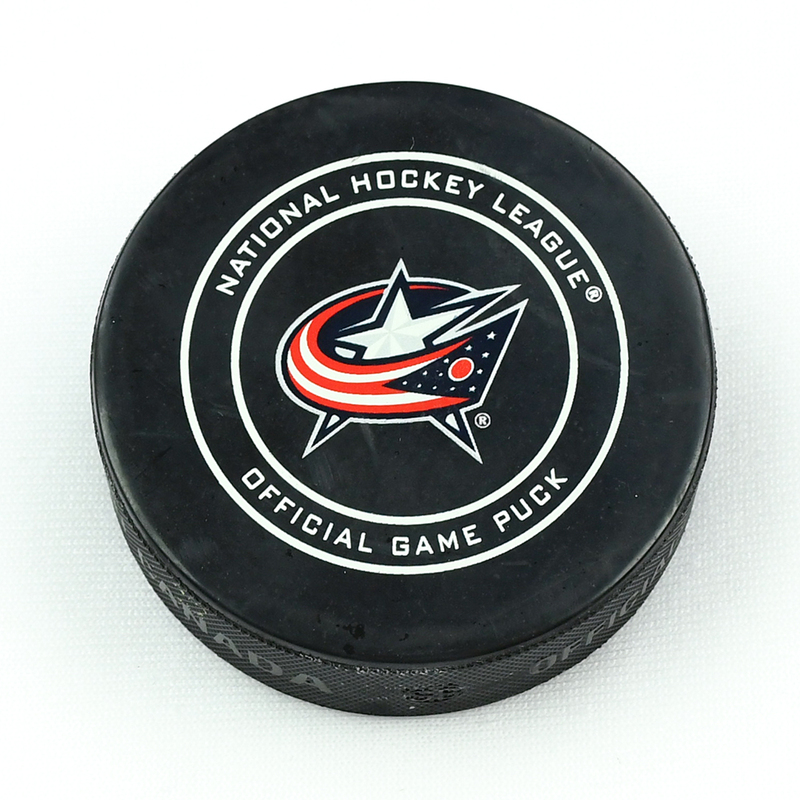 MeiGray in 2018-19 is collecting and authenticating pucks from six of our program teams: From games in Boston, Columbus, Nashville, Philadelphia, Vegas and Washington. MGG has also collected and authenticated pucks from previous seasons in Dallas, Philadelphia and New York's Madison Square Garden. 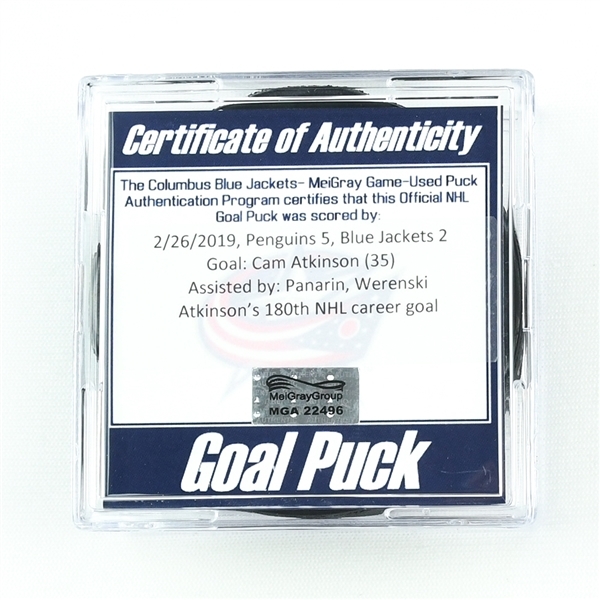 Scorers throughout the NHL, including some of the game's greatest goal-scorers, have notched goals that MGG has authenticated, and is proud to offer for immediate bid. The MeiGray Group Game-Worn Jersey Authentication Program is proud to offer fans and collectors across the globe the opportunity to own a piece of history ... a puck used to score a goal by Cam Atkinson of the Columbus Blue Jackets during the 2018-19 National Hockey League season. This is the puck that was used by Cam Atkinson to score the 180th goal of his NHL career. The goal, Atkinson's 35th of the season, was scored at 7:09 of the second period and was assisted by Artemi Panarin and Zach Werenski. The Pittsburgh Penguins defeated the Columbus Blue Jackets, 5-2, on February 26, 2019 at Nationwide Arena in Columbus, OH. This puck is registered into the MGG Game-Worn Jersey Authentication Program as number MGA22496. 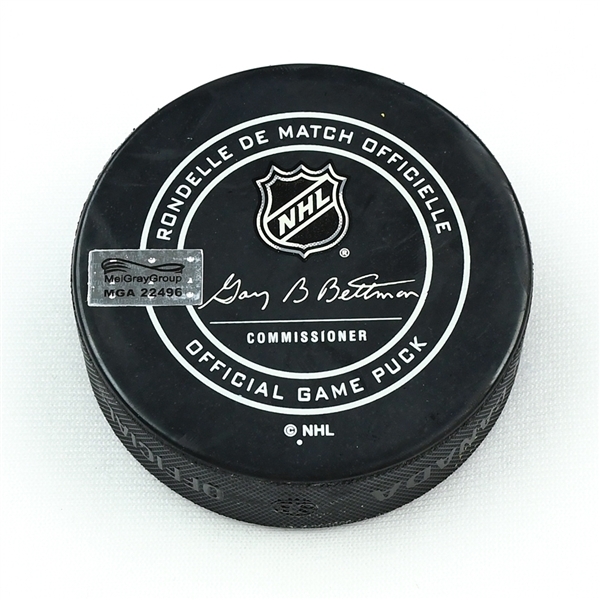 Each puck was lifted off the ice by an on-ice NHL official, identified and secured by an NHL off-ice official in the arena during or after the game, and then authenticated and affixed with a hologram by MeiGray. Additionally, with MeiGray's Game-Worn Jersey Program, every jersey worn by the participating teams contains a uniquely numbered inventory tag sewn into the jersey BEFORE IT IS WORN BY THE PLAYER ON THE ICE. This tag is equipped with security features regularly checked by MGG Game-Worn Jersey Program Directors so we can tell who wore the jersey, and when. Copyright © 2004-2017 SimpleAuctionSite All rights reserved.